Art theory and practice Prof. Michael Rakowitz’s sculpture of a Lamassu stands in London’s Trafalgar Square. The piece was unveiled March 28 and will remain in London until 2020. When art theory and practice Prof. Michael Rakowitz was nominated to propose a sculpture to top the Fourth Plinth in London’s Trafalgar Square, he was given blueprints of the plinth, which measured exactly 14 feet long. At the time, he had been researching means to reconstruct the statue of a Lamassu — an Assyrian protective deity in the shape of a winged bull — which once guarded the ancient Nergal Gate of Nineveh, near modern-day Mosul. The original statue stood from 700 B.C. until February 2015 when it was destroyed by ISIS. It had measured exactly 14 feet as well. “It immediately became a situation where I thought, ‘What else would I do there?’” Rakowitz said. His sculpture was unveiled March 28 in Trafalgar Square, where it will remain until 2020. 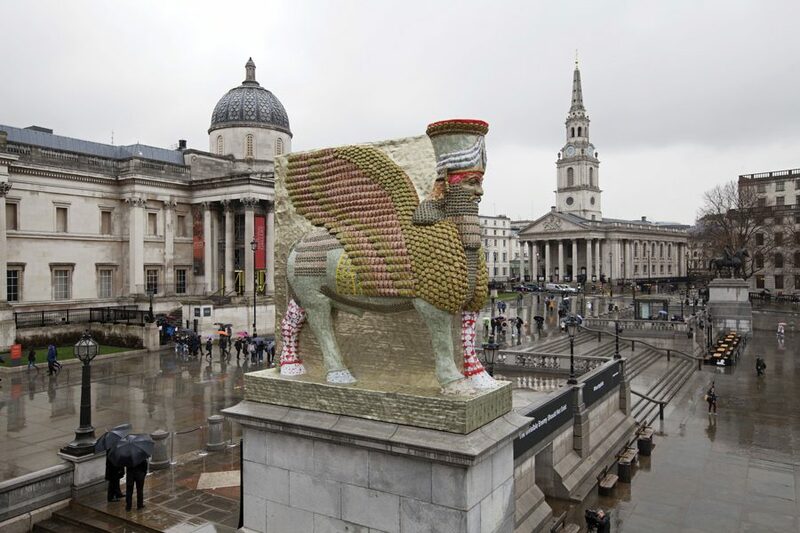 It features the 14-foot Lamassu, reconstructed out of 10,500 empty Iraqi date syrup cans. The sculpture is part of Rakowitz’s ongoing project “The Invisible Enemy Should Not Exist,” which attempts to recreate artifacts that were reported missing or looted from the Iraq Museum in April 2003 during the conflict in Iraq, as well as those destroyed in the aftermath. The sculptures are made using the packagings of Middle Eastern foodstuffs and local Arabic newspapers, Rakowitz said. Rakowitz said he began the project in 2006 because he felt the anger over the lost and destroyed artifacts “never really translated into outrage over lost lives.” The project strives to highlight some of the more prominent missing pieces, while also bringing attention to the chaos the conflict caused for millions of people. He said he chose to form the sculpture using date syrup cans in recognition of Iraq’s suffering date industry, which was once the largest Iraqi export second to oil. The number of date palms decreased from more than 30 million to three million due to the violence and destruction of the conflict in Iraq, he said. Emily Henson, Rakowitz’s studio manager who assisted him with the sculpture, said the process of getting the cans was somewhat difficult, as they didn’t want to purchase date syrup cans just to empty them for the piece. Henson said the group reached out to many Iraqi date syrup can printing factories and explained the project. One cannery, she said, reopened its business to assist with the sculpture because of its passion for the idea. Henson said she was excited to help revitalize the date syrup printing industry in Iraq and said the sculpture will not only impact viewers of the work, but the country’s economy as well. Aya Mousawi, a London-based Iraqi curator who helped Rakowitz export the cans from Iraq, said this is a deeply personal project for her. She and Rakowitz first became friends due to their Iraqi identities, and have since become like family, she said. Mousawi said it was emotional to see the sculpture, as both the United States and the United Kingdom — Rakowitz’s and Mousawi’s respective adopted homelands — were involved in the invasion of Iraq. This directly led to the destruction of historical icons like the original Lamassu statue, she said. The Lamassu’s place in Trafalgar Square, Rakowitz said, makes a pointed statement to the forces that have caused Iraq so much destruction. Unlike the pair of Lamassu housed inside the British Museum, this one stands outside with its wings raised, still acting as a protective deity for those who need it, he said.